Title: Shoot Out Over Center Ring! Synopsis: Nighcrawler's vacation plans with Amanda Sefton are cut short when he sees Arcade's private 747 on the tarmac at JFK airport. Investigating the plane, Nightcrawler overhears an argument between Arcade and a circus promoter Amos Jardine who is plotting to kill Spider-Man. Forgoing the opportunity to avenge the X-Men's recent near-death experience at Arcade's Murderworld, Nightcrawler follows Jardine to New York City to intervene in his plot. 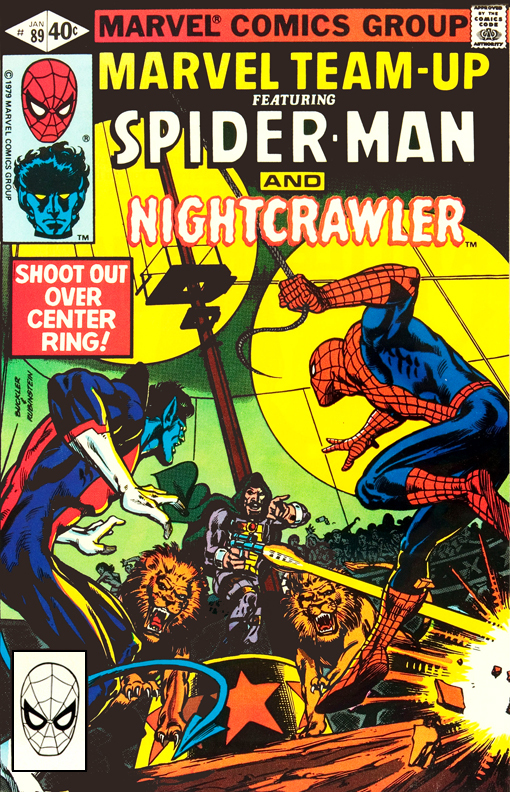 At Jardine's circus, Nightcrawler flushes out the assassin Cutthroat and partners with the Wall Crawler to bring both the hired killer and Jardine to justice with a bit of unexpected help from Arcade, who was embittered that Jardine hired Cuthroat for the contract instead of him. In a period of time before the X-Men hit it big and had multiple titles, these Marvel Team-Up appearances of characters from the team were a real treat for any X-Fan, especially when written by Chris Claremont.